The notes, posted to Twitter by developer Guilherme Rambo, include a list of new features, improvements and bug fixes slated to debut when watchOS 4.1 sees release. A hotly anticipated feature, Apple Music and iCloud Music Library Music streaming over LTE was initially promised to arrive this fall. During Apple's iPhone event in last month, COO Jeff Williams said the streaming capability would not be available when Apple Watch Series 3 launched, but would instead see implementation as part of a software update sometime in October. Developer beta versions of watchOS 4.1, released in late September, incorporated Apple Music and iCloud Music Library streaming in Watch's Music app. It appears the feature will be included in the public version of Apple's forthcoming firmware update. Alongside music streaming, the supposedly leaked release notes mention integration with GymKit-compatible fitness equipment like treadmills, ellipticals, stair steppers and indoor bikes. 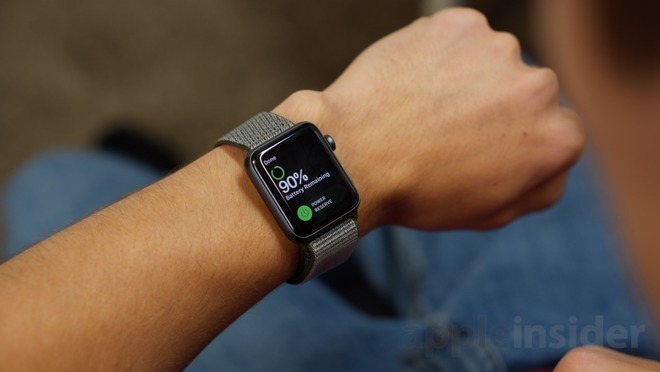 Introduced at Apple's event last month, GymKit allows Apple Watch users to connect to, and exchange data with, supported workout machines for more accurate distance, pace and energy burn metrics. As for bug fixes, watchOS 4.1 solves an issue that prevented some first-generation Apple Watch models from charging, as well as an Apple Watch Series 1 issue that display heart rate notifications when the feature was disabled. Other resolutions relate to Stand reminders and haptic feedback problems associated with silent alarms. If Apple has indeed issued an internal watchOS 4.1 GM for testing, the point update could see release as soon as next week.